For every type of fitness business, no matter the discipline! 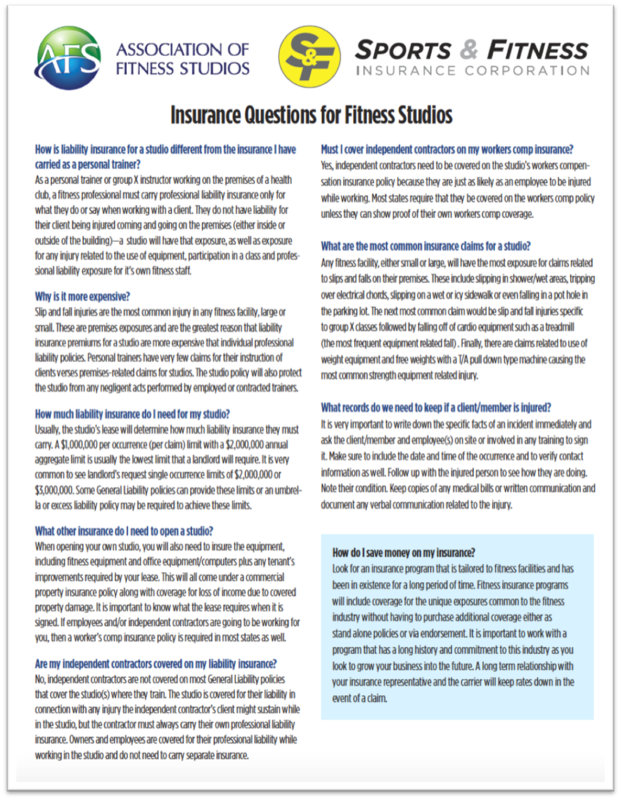 When it comes to insurance for fitness studios/gyms, nobody sells for less. Licensed in all 50 States and Canada, the SFIC/AFS program guarantees you the best rates for your customized program. Fitness Insurance Is All We Do. At SFIC the only insurance we sell and service is fitness insurance to meet the needs of your business from 500 sq. ft. to 10,000. Based on over 30 years in the fitness industry, SFIC knows the best coverage for businesses like yours. Pay only for what you really need. You’re either overpaying or possibly under covered. Get a free quote today and due to your AFS membership – save $50. The pricing range for an "average fitness business"
AFS members receive a $50 discount on the pricing above! 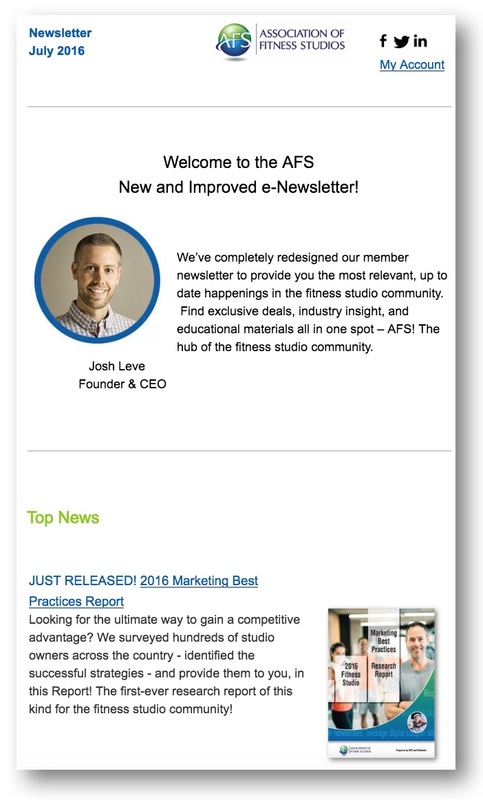 Average fitness business defined as "a studio whose revenue is derived from one-on-one or small group training and/or group exercise classes with no tranning, whirlpools, steam or sauna." PLEASE NOTE: These rates are just estimated costs and for studio liability coverage only. Additional liability coverages may be added to customize your policy. Workers Compensation and Property coverage may be added at an additional cost. Protects you from claims related to the instruction that you provide (or don’t provide) for your clients. Receive maximum protection for the primary service you deliver. Protects you from claims resulting from your facilities rather than your actions or inactions. These can be simple slip and fall to possibly more severe injuries resulting from use (or misuse) of fitness equipment or participation in exercise activities. This coverage protects you from claims related to items you sell. Many trainers sell balls, bands, mats, and nutritional products. Personal injury coverage protects you from claims of defamation – libel, slander, or inadvertent invasion of privacy. Commerical Property coverage is also available for small or large contents and equipment, tenant’s improvements, building and business income coverage. Workers Compensation insurance is available, as well as Surety Bonds. Providing coverage that protects you and your business from claims related to use or misuse of personal information or photos in verbal, print, or electronic media. Protects and defends against allegations of sexual misconduct, be it verbal or physical. Fitpros are especially vulnerable to this situation due to the physical nature of instruction. Reimburses a third party, such as a hospital or doctor for medical expenses (up to $10,000) incurred due to bodily injury, including athletic participants. This is voluntary, no-fault coverage to pay medical bills. Incredibly helpful docs to provide further clarity on the benefits of insurance through AFS. Looking for fitness professional insurance? Click here for more information. Q: I need insurance for the trainers/instructors at my studio, do you offer that as well? A: Yes! If you own the studio, we have plans that cover you (the studio owner), your direct employees, and all of the clients training in your studio - but it does not cover an independent contractor for their own individual professional liability. Keep in mind that you can also save your trainers/instructors lots of money by referring them to AFS to receive their professional liability insurance as well. Q: I'm already an AFS member, how do I get insurance? A: Great! Email us and we'll connect you with an SFIC agent to handle all your insurance needs and apply the AFS member discounts. Q: How do I renew my insurance? A: Your dedicated SFIC agent will reach out to you prior to your renewal date to handle your renewal quickly and professionally.